• Quick&Clean smooth edged double-sided business cards. • Premium heavyweight cards offer outstanding print quality. • Patented Quick&Clean 'snap free' technology enables you to separate cards with totally smooth edges. • Free software and inspiring design templates available to download from www.avery.eu. • Print easily on both sides; using a colour laser printer. • Enjoy the flexibility of tailoring cards to different situations, changing details where necessary; to the quantity of your choice. 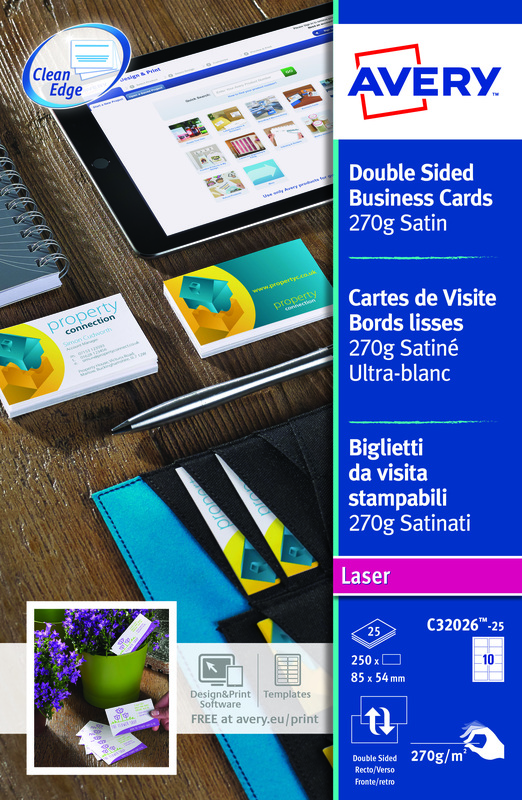 • Perfect for business cards place settings, appointment cards and so much more. These stylish, heavyweight 270gsm business cards are suitable for use with laser printers and feature a super smooth, satin finish. The cards can be printed on both sides, allowing you to feature additional important information, such as opening hours, directions, services and more. Each white business card measures 85 x 54mm. This pack contains 25 A4 sheets with 10 business cards per sheet (250 business cards in total).